Neither of us knew how to be married. This was not dangerous in itself, although it did get us into many awkward situations. Left to ourselves, of course, we found it hilarious. Early in our marriage we would play house-house as if it were a children’s game in which we sometimes got to act like grown-ups. This is what saved us eventually. To be honest, neither of us wanted to get married either. But again, it was awkward spending so much time in each other’s homes and trying to keep our parents convinced that we were really just hanging out innocently. We were a little weird with each other too. He wasn’t a boyfriend-type, though I must admit I was a real perfect girlfriend. On the other hand, when we did get married, I had no intentions of being anyone’s wife. Before we were married, we would “break up" with each other regularly and repeatedly and I would always assume it was the end. I’d feel sick and shattered and prepare to mope around for a while, watching too much television sitting too close to the screen and taking on so much work that I would crash with exhaustion. He would usually call me in a day or two and try to set up our next date. “We can’t meet," I’d say to him. “I am coming towards your office in the evening. What time will you be free?" he’d ask. “We have broken up," I would remind him, trying to not let my voice break. But he wouldn’t get it. “What does that have to do with meeting today," he’d ask, as if I was being completely illogical. “Just because we have broken up, doesn’t mean we can’t meet and talk." And we would meet. Or text. Or e-mail. Or chat online. During one of the break- ups, I turned up at his home in a village in east Uttar Pradesh with my news television crew. His mother hosted us and extended family members took us around, helping us get interviews and shots for a report on the upcoming elections. He and I sat up late admiring the moon from the inner courtyard till Ammi got out of her bed to ask us to go to our rooms and sleep. We changed cities to get over each other. I went to Bhilai on a sabbatical from my TV job to teach a media course. He went to Bangalore to work for an IT startup. He got an H-1B visa and accepted a job in Chicago. True to form, he turned up in Bhilai to visit me when I was there. He was travelling from Morbi in Gujarat to Delhi and told me that he was coming to visit me because Chhattisgarh was on the way. My students and colleagues gave him a hero’s welcome even though they had never heard of him before. He bought me a silk saree from Bangalore. I helped him shop for Levi’s jeans and new shirts before he left for USA. He turned up at my documentary shoot again when I was in London a few weeks later, carrying heavy equipment and nursing my broken heart. He helped us carry our tripod and light kit all over the city. My colleagues loved him, of course. I learnt something from the break-ups. Because they seemed so final to me, and because each time I would decide to end the love affair with more firmness and determination, I got to experience how I really felt with and without him. I got to taste misery on both sides of the border of love. I found out that he expressed love differently and he experienced the loss of love differently too. I did not know that this would remain a constant in our lives. I still expect that one day we will align on these parameters. Aren’t we all a little crazy? I know you are shaking your head and saying, “Yes, but not as much as you." Trying to make love work is a crazy idea. It is a useless as well as an essential pursuit. Meanwhile, the rest of our life is always there to distract us when the difficulty level of love seems to overwhelm us. This works the other way round also. We thank our stars for the pockets of love and calm we can retreat to when the complexity of life exhausts us. “Will you marry me?" We kept proposing to each other unexpectedly for years after we were finally married. And had children. And had been “accepted" by all the layers of aunts and uncles who had been left out of the decision making process when we had officially got married. Popping the question every now and then is cute, but as everyone knows, it is best to time it when the answer is likely to be close to the one we are hoping for. In our case, asking each other once again if “you will marry me" is a way of reiterating that all said and done, “I still want to marry you." Sometimes it’s a way to ask if we are finally ready to be married-married. Like seriously married. Like proper husband and wife. As if, if we lie low when it gets stormy and stay patient, there is really an ideal that exists for us to arrive at. Irrespective of dreamy aspirations, it is often an effective strategy to lie low and stay patient in life. It’s a great place to get rest. Make resolutions. Meet others and rediscover the first flush of new love. Make friends with one’s own self all over again. Sixteen years later, we continue to misunderstand each other in rather silly ways. Sometimes I say something romantic and still get very unexpected results in response. “I’m not responsible for taking care of the psychological vacuum in your head," he said to me the other day and I was like, “Hey, hello, I was just trying to flirt with you." At other times, he will try a clever trick hoping to charm me but I will jump out of my skin and deliver a lecture recounting my unhealed traumas and other childhood anecdotes. Like most other institutions, the template of marriage is dangerously outdated. Men, women and children want to be fuller, more flexible versions of themselves. We want to claim personal autonomy. We want our needs to be respected. Our personal growth will not be postponed interminably. It has pushed its way through the hierarchy of urgencies. Then there’s always travel. When we don’t know how to find peace with each other, or peace from others, we leave home to travel. It always helps to disentangle and reset our boundaries. We spend our lives looking to find our way back to the homes we are fleeing from. Once there was safety in breaking away. When we are stronger, we need closure. Reconciliation. The great journey of life is to trace the route that takes us back to where we had started from. Excerpted with permission from Simon & Schuster India. 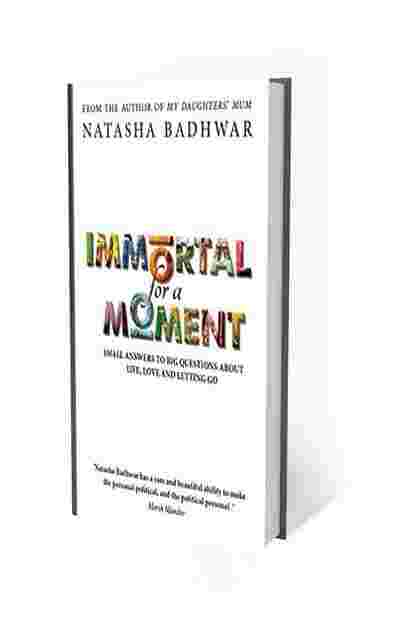 Immortal For A Moment: Small Answers To Big Questions About Life, Love And Letting Go will be released on 11 December.